Alex Bertollt, standing with his family, is the lone senior honored at Friday’s Arlee Mixer. 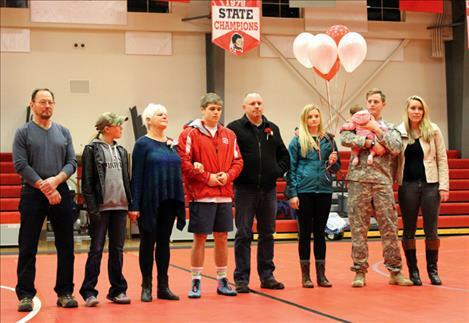 Wrestling for the last time in his home gym, senior Alex Bertollt was honored at the Arlee Mixer on Friday, Jan. 29. Being the only senior on the Arlee Warrior wrestling team, Bertollt has found himself in a leadership position for his younger teammates. This year Bertollt has a record of 25-2 and an overall career record of 156-38. Last year he finished third at state and in 2014 finished sixth. Bertollt has also been an All-State wrestler for the past two seasons. Teammate Tyler Potts has appreciated Bertollt being a leader for himself and other Arlee wrestlers. Along with Potts, Head Coach Ken Hill has enjoyed his lone senior being a role model for this year’s wrestling program. Hill is impressed with the amount of improvement he has seen in his wrestlers since the beginning of this season, however “practices are still tough,” Hill said. Aware that this squad is young, Hill is looking at the future of his program. 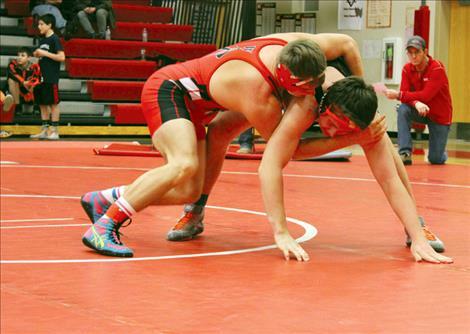 As the season is coming to an end, Bertollt is still working on perfecting his wrestling in order to succeed at the end of the season. Bertollt would like to wrestle as a walk-on at the collegiate level, but is focusing on finishing his final season as an Arlee Warrior on top. Arlee Warriors will head to Divisionals on Saturday, Feb. 6, in hopes of making it to State. For area youth wrestlers, Arlee will be hosting a Little Guy mid-junior level mixer Tuesday, Feb. 23; a beginner/novice wrestling mix Thursday, Feb. 25; and on Saturday, Mar. 12, will be hosting a Unit 2 Little Guy wrestling tournament.